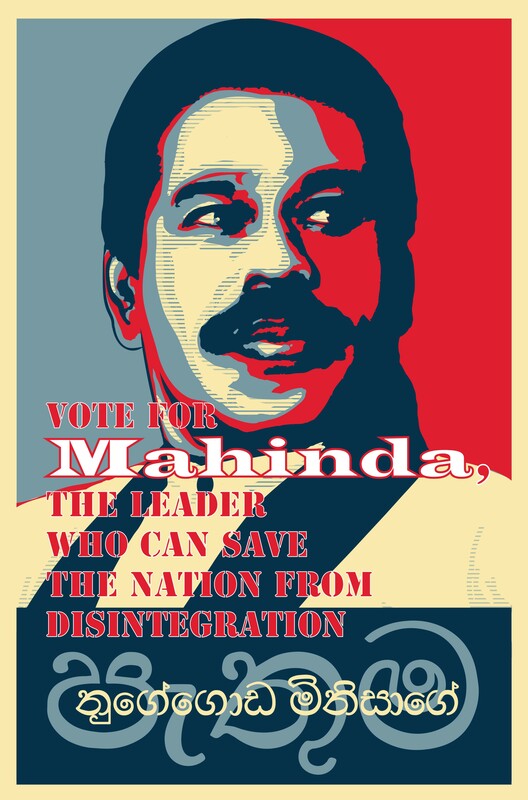 LankaWeb – Vote for Mahinda, the leader who can save the nation from disintegration! දේශය බෙදී වෙන්වීම වලකාලිය හැකි, රට දේශීය හා විදේශීය කුමන්ත්‍රණ කරුවන්ගෙන් බේරාගත හැකි ජාතික නායකයා වන මහින්ද රාජපක්ෂ මැතිතුමාට චන්දය දෙන්න!! Geeth has brought up the most important point again …. TO SAVE LANKA FROM DISINTEGRATION, VOTE FOR MAHINDA !! The SUNDAY NIGHT MASSACRE of the SLFP and National LIst STUFFING! by Somarama Sirisena! WHO is the DICTATOR now??? Aug 17, Colombo: Sri Lankan President Maithripala Sirisena has ordered the removal of 25 members of the Sri Lanka Freedom Party (SLFP) Central Committee. The President in his capacity as the Chairman of the SLFP has reportedly sent a letter to the Elections Commissioner informing him of the removal of the central committee members. Media reports said that the President has appointed 25 new members to the central committee and the newly appointed SLFP General Secretary Duminda Dissanayake has signed the appointment letters of the new members. Sri Lankan President as the leader of the SLFP has taken these measures to cleanse the party of the members loyal to the former president Mahinda Rajapaksa, a party source said. The expelled members include Ratnasiri Wickremanayake, Susil Premajayantha, Anura Priyadarshana Yapa, DM Jayaratne, John Seneviratne and Janaka Bandara Tennakoon. IS Ven Sobitha BLIND …. He expresses “concern” while the “Yahapalanaya President” he supports VIOLATES ELECTIONS LAWS by unilaterally STUFFING the National LIst … on the VERY DAY of the General Election! What is the Elections Commissioner Deshapriya going to do ….. TWIDDLE HIS THUBS … smiling like a Chesire Cat?? On the VERY DAY of the ELECTION, Somarama Sirisena has CHANGED the expectations of the UPFA Voters of Sri Lanka that the established officials and candidates they would be voting for WOULD NOT BE ELECTED, because at the LAST MOMENT Somarama Sirisena has expelled those candidates! Now, when citizens vote for the UPFA, they would be electing Somarama Sirisena’s hand-picked stooges amoung to over a third of those actually running in the election! WOW … what a farce! This sets the stage for NULLIFYING the ELECTION ! This is ELECTIONS LAW VIOLATION on a GRAND SCALE! Somarama Sirisena has IMPEACHED HIMSELF in GRAND STYLE! So much for “Good Governance ” and “Yahapalanaya”! YAMAPALANAYA come home to ROOST! A Coup-de-etat …. NOTHING LESS! National Movement for Social Justice leader Ven. Maduluwawe Sobitha Thera along with leaders of several other civil society organisations met Elections Commissioner Mahinda Deshapriya yesterday and urged him to ensure a free and fair poll. The group met Deshapriya amidst rising polls law violations in the last two days, especially since all elections related promotions ended on midnight, Friday. Ven. Sobitha Thera told the Daily News that he and other civil society leaders had pointed out several polls law violations to the Commissioner and had urged him to take action to prevent such occurrences. According to the Thera, the Commissioner had said that he has looked into some of the complaints and will inquire into the others. Ven. Sobitha Thera, while noting that the 2015 general election was one of the most disciplined and peaceful in comparison to polls in the recent past, said he had urged the Commissioner to maintain the status quo until all election related activities are over and a new government has been appointed. Questioned whether he raised the issue related to Kurunegala district candidate and former President Mahinda Rajapaksa distributing white Sil cloth at several temples in Kurunegala on Saturday, Sobitha Thera said he did not do so. An election watch dog, Campaign for Free and Fair Elections (CaFFE) lodged a complaint against Rajapaksa accusing him of distributing white Sil cloth at several temples in Kurunegala on Saturday, violating election laws. Meanwhile, NMSJ Secretary Sisira Jayamaha said the group which met the Commissioner had raised a number of issues including polls law violations. Jayamaha said the Commissioner had assured he will take action against wrongdoers whoever they are. The civil society combine had played a pivotal role in the run up to the polls in educating voters on the importance of electing candidates with a clean slate to the 8th parliament of Sri Lanka, which would be convened after today’s poll. The civil society groups held island wide meetings to educate the voters and also played a key role in pressurising candidates, political parties and authorities for conducting a free and fair poll.